It's been one of those weeks... you know, the one where you start the week thinking you have it all together - the menus planned out, ingredients purchased, schedules set and manageable, and everything looks so darn organized. How does it all fall apart so quickly? First of all, the more than 178 miles I put on the car in six days without really leaving my little town of Carlsbad has me cringing when I need to head back out on the road. $80 took care of the empty tank, but I've watched the gas meter drop ever so quickly. Between the kids contradicting school schedules, trips to drop and pick up my son at the gym, Liv's regular and extra dance rehearsals, visiting my mom who is recovering from hip surgery, the store for regular groceries and then the last minute shopping for the big dance show tomorrow, I'm exhausted. Add in Liv's last minute costume arrivals for the dance season (she dances competitively for a local studio) and you have me sewing in my "spare" time (I don't know how to sew... you can imagine my "pretty" stitches), applying rhinestones to any bare spots on the fabric (I have a new appreciation for sparkle) and much to my son's amusement he found me on my knees out in the back yard rubbing an old pair of his jeans on the concrete for a "well-worn" look and holes in the knees for the small group tap number that has them dressed like farmers. I still have elastic to sew onto the hats, a crown to rhinestone and socks to trim. The show is tomorrow at 9:30. I think I'll make it. With my head swirling with altered schedules, the menus somehow got lost in the fog and as dinnertime would approach 6 human, 4 canine and 2 feline hungry eyes would begin looking my crazed direction wondering when dinner would arrive. Realizing it was 6 PM and I had thawed the chicken but never done anything with it I gave in. I'm not really a package girl, I like to prepare our meals fresh without the unknown ingredients that sometimes come along with things in a box or bag. I do organic, fresh and local when I can, but sometimes a girl just needs a little help. I turned to the beloved package. A few years ago my friend Becky (of Becky's Football Stromboli) had us over for dinner and served the most wonderful Peppered Chicken. Fresh from the grill it was tender, flavorful and one of the best meals I'd had in a while. Frequently we share recipes and I immediately asked for this one. She casually comment she'd show me later. As we cleaned up the kitchen she tossed a McCormick Grill Mates Package labeled "Peppercorn & Garlic Marinade" my direction. My jaw dropped... this awesome chicken I had just raved about was from a package??? Yep. It was indeed. Since then I have stocked up on the Grill Mates for just the occasions that this week provided. (Note: Neither McCormick nor Grill Mates knows that I'm writing this post, I have received nothing from them in any way... but would happily test anything if they offered!!). Requiring meat (chicken, beef, pork), oil, water, sometimes vinegar and the packet, dinner is on the table in about 36 minutes from start to finish (assuming you have thawed the meat which on occasion I've been known to forget to do). Our favorite is still the Peppercorn & Garlic that Becky made for us, but the Chipotle Pepper and Garlic Herb and Wine versions are also very high on our list. I have yet to find one that the entire family is not pleased with and never have a complaint when I serve the freshly grilled, tender and tasty chicken. Proud Mama moment here...I can't help sharing my girl with you all. Here's the video from Nationals in Vegas last year where she scored 6th place overall in her solo! We'll have a new video in a few weeks from this year's season. Nevermind I should get up and help you out! I thought *I* was busy this week, sweets you are the definition of extremely busy! You deserve a medal, girl. Where's YOUR trophy? :) Rubbing jeans on the concrete...that's that it's come to. Although Ethan just got some jeans that have quite a lot of holes in them I'm amazed at how styles have changed. I'll keep these packages in mind when I am having one of those days. Your chicken looks delicious I'll have to make it and keep leftovers for a sandwich! Wow your daughter is SO talented! I'm amazed at how incredible of a dancer she is. :) Thank you for sharing the video of her. And congrats to her. The chicken looks soooo good and flavorful. Sometimes I get so busy and lots of times I don't feel like putting a ton of effort into dinner. I need to try these seasoning packets. They sound so good! 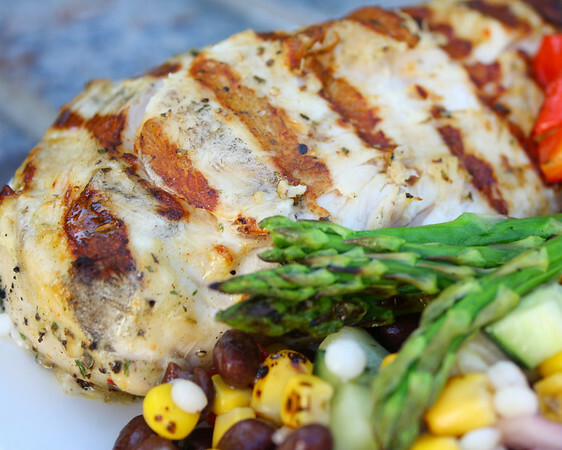 your chicken is a great way to have a nice meal when you don't have time, and its certainly not a bad idea to use some pre packaged items, I do it all the time, there are only so many hours in the day!! Your daughter is so talented, and she's only 11, right? Looks like she has a bright future ahead of her in the dance world. 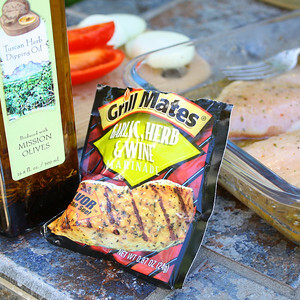 That marinade sounds good, but we can't use those packets, because of the high sodium content. C'est la vie. Your daughter is a great dancer! Congratulations! Funny thing happened when I opened your blog page - Google offered to translate it for me from ... Norwegian :)). It's so helpful having at hand a package or two. I keep in my pantry some professional solutions (we used to have a restaurant and I got used to professional jars & packages) that I buy from specialized cash&carry stores. When in trouble (lack of time, too many unexpected guests etc), I use some for marinades. Wow, Liv is so talented! You all must be so proud!! Hope you get to relax after your busy week. I'll have to try these mixes. I love having easy meals like this at the ready for those crazy days! Great idea!! Your daughter is a great dancer and I understand the pride we have as mom's mine is a dancer too. Oh Kim... please tell Liv that this wonderful performance of her's cheered me up as I'm currently in a funky state of the blahs and blues from all my work :-( She is extremely talented with such an enthusiasm for... everything! Make sure she never loses this wonderful characteristic of hers. This isolates report is taking a long time to generate. The whole day has been blah, though. Sometimes it's worth it to have the "kitchen helpers" like McCormick's. I have a large container of a chicken rub/seasoning I use often when I'm really not feeling the extra prep time. Great post! I am just in awe of Olivia. So talented and boy can she bend that body! A real pleasure to watch and understandable you're so proud of her. 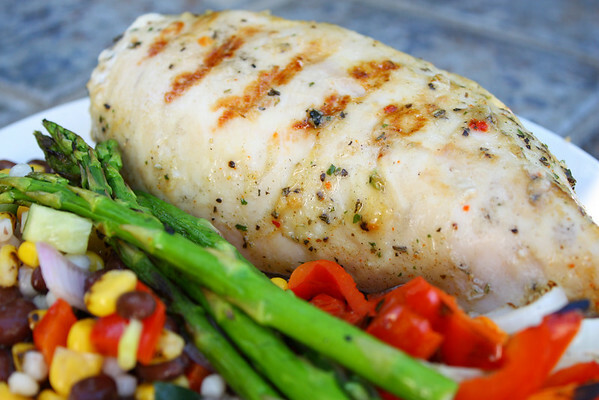 The chicken looks a great, tasty and quick supper. We all need a quickie recipe like this up our sleeve. Guess what? I use those seasoning packets too...I love the garlic/herb/wine one. I put chicken or shrimp in a zip bag...along with olive oil, a bit of water, balsamic, and two grated garlic cloves! Let it sit in the fridge for an hour or two...then cook. It's so good. I know how much you dance-moms do for your girls - we have a cousin who has a dancer...she's always sewing sequins on something, it seems :lol:! Wow, woman, you really did have quite a week. You make me dread when my kids are older and have all that stuff going on! But packets are REALLY useful sometimes. Liv is just so cute in her pics and video. what magnificant grill marks just perfect, love that picture! Your daughter is super talented! And you are super awesome for balancing so much and managing to get a healthy dinner on the table. I seriously think too many families resort to fast food with a schedule like yours and definitely applaud your adaptations to dinner :) Hope this upcoming week is a little less hectic for you! I keep getting the "try again later" message when I try to see Liv's video....I'll keep trying! There is nothing wrong with a little help from a package, if it weren't for those packages I never would have made it before I met my husband! The Grillmates seasoning packs are killer. We use the in the summer all the time. Baja Citrus and Hawaian Luau with fish are so tasty. Easy isn't always bad! Liv is so fierce! She is so awesome...btw, I put a link to my dance company's website if you girls want to check it out. The chicken looks so yummy.. If you find a packet mix that works for you then I say go for it. I have one that I use for from Australia that we love. It really hits the spot when dinner needs to be quick and easy. Seriously, I don't know how you do it with the sewing. I have a friend who takes pity on me when I need anything like that. Actually I bake for her when she needs it and she sews for me - a match made in heaven. I hope that Olivia's show went well. Oh I just loved seeing her! Such energy! Such passion! I know where she got it from :-) Thanks for sharing your creativity in the kitchen! This chicken sounds great. Your words, recipes and photos always bring a big smile to my face. Have a great Monday! She is so talented and congrats to her. Thanks for sharing the video with us :) after watching it..I am proud of her too ! *whistle* You are a busy lady! Congratulations to your daughter, and to you for being able to keep up with her and still take care of all the other mom-related business in your house. ^_^ I've been known to use McCormick marinades too; my family loves the peppercorn on steak! Liv is awesome and you are, too, for managing your crazy schedule. After reading this I'll never complain again about being busy, LOL! I admit that I usually ignore the packaged marinades but I won't walk quickly past them next time. Thanks for sharing, Kim. I'm always open to new, easy ways to prepare chicken. She is just so darn precious and talented. And so very flexy too! You should be proud mama! Grillmates sound like a great solution to me. Glad it worked for y'all. Will have to try some for us. My busy excuse is just work :( No sparkles there. What a cute dance routine! She is a great dancer. I feel for you as the dance mom, "sewing" and gluing and all the rest that goes along with it. 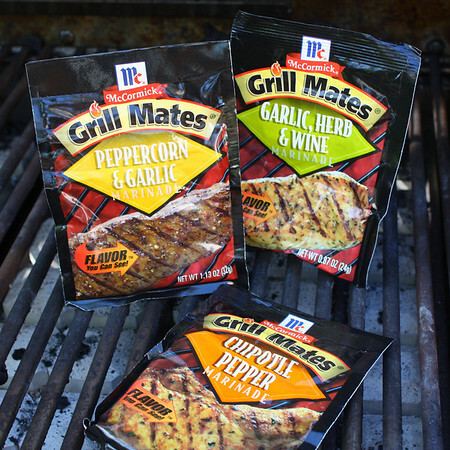 Those grill mates are the perfect solution for weeks like you just had. Love the description of your active day... reminds me of some days here at Chez Bullhog. Only last week I threatened to buy a chauffer's hat for my daughter. And there's nothing at all wrong with a little labor-saving package from the freezer. Heck, that's what Trader Joe's is all about! And holy wow! You have patience. Sewing sequins would drive me insane. Your daughter is extremely talented and has such great personality! I loved her routine! I never tried these packages but I believe you when you say they're delicious. I am always looking for new ways to make chicken. Ugh. I hate that I'm so late to the party. So far behind in everything. I'm glad I stopped by and got to see that amazing video. May I just say that if I had attempted even one of those moves I'd be in the hospital crying like a little baby with a team of doctors trying to stitch back together all the ripped muscles. Holy cow, Liv. You are one limber, lithe and fantastic dancer. I will try those Grill Mates on your recommendation. Some nights we need all the help we can get. Can't wait to see more of you Liv. I'm totally impressed. WOW. WOW. WOW. She's an amazing dancer. She's so flexible, too. Good job! Wow that video is awesome! Making dinner with a package is definitely worth the sacrifice to see your daughter dance like that!